1. Do I need to book a Charter Yacht for an entire week? 2. What is a bareboat charter? 3. What is a crewed charter? 4. Do I get a Charter Yacht cheaper by contacting it directly? 5. Do I get to sign a Charter Yacht Agreement? 6. Do I pay BoatsAtSea.com as the agent? 7. How do I know the Charter Yacht I booked is in perfect and seaworthy condition? 8. Do I have any extra costs to expect? What and how much are they? 9. Why can't I find a Charter Yacht that accepts more then 12 passengers? 10. What means “A.P.A.” or “MYBA Terms” in the rate description? 11. How do I pay for my booking of a Charter Yacht? 12. Do I get transparency with my payments and how do they go to the Charter Yacht? 13. How do I know the Charter Yacht is there when I arrive? 14. Are Credit Cards widely accepted? 15. What do I need to pack for my Charter Yacht Vacation? 16. Do I have to worry about seasickness? 17. What is provided for us on-board our Charter Yacht? 18. What is required for a Yacht Charter Vacation? 19. What is the dress code in the Island’s? 20. Where do I fly to? 21. Where is my port of boarding and meet the Charter Yacht? 22. How can I be reached in an emergency? 23. Will my cell phone work in the Islands? 24. Can we SCUBA Dive off the Yacht? 25. Are little sailors and small children on-board OK? 26. Is fishing permitted off the yacht? 27. Should I pack our own snorkel or SCUBA gear? 28. How do I hand gratuity over to the crew and how much is appropriate? 29. Do I need Trip Insurance? Absolutely not. Usually the charter yacht catalogs pricing is calculated for a weeklong charter, some yachts offer daily rates and you go as long or short as you like. Some yachts charge a surcharge if the charter is shorter then 4 or 5 nights. All depending the region as for example in the Mediterranean, the yacht managements prefer a typical weeklong charter being from Saturday to Saturday, in the Caribbean this is much more flexible. A permanent hired crew takes care of your charter yacht; similar to staff in a villa or hotel. They are in charge of your wellbeing, are your personal chef, stewards, engineer, sometimes fitness/sport or dive instructors and deckhands, this list can go on the bigger the yacht. Plus of course your charter yachts sea savvy captain, who will be entertaining you with some of the many stories he has to tell. Most likely not. The rates on BoatsAtSea.com are given by the management of the Charter Yachts. If there is a discount or a special offer, we are the first ones to know. BoatsAtSea.com maintains a close relationship with all the agents; if you are looking for a better rate, then talk to us. We can contact some agents and see what we can come up with, just ask us! Yes, absolutely! Once you have chosen your Charter Yacht and you know the number of your charter sailing group, we will issue a standard and approved CYBA (Caribbean Yacht Broker Association) or MYBA (Mediterranean Yacht Broker Association) Charter Contract. No! The service of BoatsAtSea.com is free of charge to you and we solely act as the mediatory agent. Similar as any other travel agent, BoatsAtSea.com works on a performance basis. The yachts management or the owner offers us a commission percentage out of the charter fee. This is for taking care of all the questions, endless paperwork, and international payments; but mostly for the effort to find you, the happy charter yacht guest! A very important question! All the Charter Yachts displayed on BoatsAtSea.com are obliged with a committing contract to a management. These are committed to obey the control of their Charter Yachts and are in charge to fulfill the local maritime laws and regulations; these rules are quite strict. Local Coast Guards constantly checks paperwork and registrations of the Charter Yachts and the crew, if not in order a confiscation of the yacht is at stake; the fines are hefty and extremely painful! Most cruising destinations require a “Trade License” or similar and without the proper paperwork or insurance proof, a yacht will not get their annual license issued. Crew’s need safety standard certifications (STCW95), work permit and must undergo regularly medical checks. If you wish, you can ask the captain to show you all the paperwork. We do track record with other agents and of course with our clients, your comment is the most valuable to us! Also important, BoatsAtSea.com visits every year the International Charter Yacht shows in the Caribbean, USA and Europe, to check and see for ourselves. We pay high attention to the smallest details, our experience helps to see and determine quickly if a yacht meets our high standard and if we want to offer it to our clients. The general rule “the newer - the better” works in most cases, but for example an owner operated Charter Yacht mostly is even after many years still in a pristine condition. Depending on the type of yacht, the area and the rate type you might have some extra costs. But of course BoatsAtSea.com will make sure, that you get a list of the estimated “extra cost” calculated down to the last bit. BoatsAtSea.com has NO HIDDEN COST. However, some “extra cost” may occur all depending on your itinerary and destination. To get a full price calculation of a yacht you like, send us an inquiry for this yacht and indicate for which dates you would like to charter the yacht. Also we need to know the group size and if there are any children and their ages at the time of charter. The more we know about your intended charter the better we are able to give you a full calculation of the expected costs. The international maritime law regulates this; it generally means any yacht, no matter charter or else, carrying more than 12 passengers, will be considered a “passenger transportation ship” and must comply with the SOLAS convention (Safety of Life at Sea) law by the IMO (International Maritime Organization). Of course this is all about the passenger safety. SOLAS list of required safety restrictions are very expensive to implement and this would reflect in rapidly increase the charter yachts rate! That is the difference between charter yachts licensed for up to 12 passengers and passenger transportation ships being licensed for over the usual maximum of 12 passengers. There are however large charter yachts that comply the SOLAS convention and BoatsAtSea.com can recommend you a good selection of charter yachts that would be perfect for your large group. Find a list of yachts which hosts more than 12 guests HERE. 10. What means “A.P.A.” in the rate description? The Advance Provisioning Allowance is essentially an allowance given by you to the Captain or head steward of your charter yacht, just like a bank account, in order to provision the yacht on your behalf. APA is an efficient way on finding your charter yacht fully provisioned upon your arrival and during your cruise, no hassle and no record keeping. BoatsAtSea.com generally suggests a certain percentage that will be added to the contracted charter rate; now here the numbers differ! This is all depending on the type of your charter yacht; hence fuel consumption, which is a significant difference between a motor yacht and a sailing yacht. A sailing yacht may estimate between a 15-25% surplus and for a motor yacht calculate a 25-35% surcharge due to the obviously much higher fuel consumption. Find a complete explanation of extra cost HERE. The most common way of paying your charter rate and APA (if applicable) is to mail a check or to wire the amount to our US business bank account or if you prefer (as European) to our Swiss business bank account. Your payment then will be transferred to the yacht agent, secured in the agents escrow account and paid to your charter yacht 10 days prior your boarding. Before you make a payment, you will receive a fully stated explanation of the payment schedule in the currency of your charter rate. Yachts and agents get paid in their local currency only! We are not allowed to accept payments in your preferred currency, as BoatsAtSea.com would have to arrange for the forwarding transfer with a currency exchange for you. In some cases although, we could make an exception, please communicate with us. Our bank can handle the income/outgoing transfer from your preferred currency into the yachts currency, but be forewarned, their charge may be higher then the usual bank exchange rate. Yes, all your payments and any other documents are in a special folder in our secure cloud based server. You will get a link to it, so no need to send a lot of documents around, they are all save in ONE place for you anytime accessible. BoatsAtSea.com may be an “online company”, but we work just as if we all are sitting in the same office. We want you to feel save and comfortable with our services and us, so we offer you the transparency on all your payments and its schedules, you don’t even have to ask. This is all risk-free; we are here to protect you and your money. Usually we transfer deposit to the yachts management as we get it from you, but if your charter departure is more than 12 months away, we will only transfer an initial deposit and the rest is safeguarded at the yacht managements escrow account, this is for your protection. Then we pay the yacht just before your charter due date. This is why BoatsAtSea.com prefers bank transfers – they are easy, fast, transparent and secure. Should you have concerns about BoatsAtSea.com, you are welcome to request a bank reference and clearing house/ yacht management recommendations letters. Every charter booked is contracted via you and the yachts management/owner directly! This is an important protection for you; each contract is registered with a reservation number in the central listing that prevents as well from double bookings! BoatsAtSea.com has its own Booking Operations System; it simplifies our work and streamlines the process of each booking, keeps record of each email exchanged and sends out automatic payment reminders. All our represented yachts are registered with individual agents, these make sure that at all times we at BoatsAtSea.com are in the loop of the whereabouts of each booked charter yacht. Your charter yacht may just return from a long haul sailing trip, maybe even from Europe, all the way across the Atlantic Ocean and still we know where the yacht is and if the winds are favorable or not. Nowadays with new and more modern technology there are daily updates on long distance crossings. But nevertheless, it could be potentially possible that your yacht is experiencing a delivery delay or a mechanical issue is hindering the yacht to be on time on your harbor of meeting. BoatsAtSea.com will be aware of that even before you are leaving your home and will be taking care of whatever is needed to suit your now altered situation the best. Therefore we are here, we represent you as our guest & client and deal with the odds, once you arrive we are ready to present you with a solution. Please read carefully your charter contract, as this is a part of your charter yacht agreement. BoatsAtSea.com recommends at any time trip insurance to make sure you are fully covered if anything unpleasant or unforeseen may occur! Yes, most Islands do have ATM machines, and shops may accept debit/credit cards. But its advisable to bring some cash along for the taxi driver or coffee/drink you may order along the way. In the Caribbean the same applies for all the Virgin Islands, in the BVI’s you may not find many ATM machines as in the USVI’s, as well the smaller islands of The Grenadines. In the Windward Islands you find yourself sometimes confronted with currencies like: NETHERLAND ANTILLES GUILDER, the EURO or the EAST CARIBBEAN DOLLAR, but the good old US DOLLAR greens are widely accepted in shops, bars and restaurants. Storage space mostly is limited on a regular Charter Yachts, unless you have booked the ultimate mega yacht. Charter yacht crew advises SOFT COLLAPSIBLE LUGGAGE, suitcases in most cases cannot be stored! Post-charter-comments made from our BoatsAtSea.com clients tell us, that next time guests know better, as they packed twice as much as needed! We recommend 2-3 swimsuits and 2-3 pairs shorts, 3-4 T-shirts, as you probably will buy some in the local art craft shops. Bring a 30-45 SPF sunscreen, higher SPF for children, NO spray types please, as the yachts deck can get very slippery with it when wet. No tanning oil, PABA or Bronzers please, they stain the upholstery and white deck. No, you don’t! BoatsAtSea.com recommends for that case Catamarans, seasickness is not common. These are heavy built and sturdy new generation yachts, think being floating on a larger air mattress! Rest assured, Catamarans are designed for comfort and stability! General rule is; the larger the charter yacht the more stable. In the Mediterranean you will find “Gulets”, the equivalent to the Caribbean Catamarans. These are traditional Turkish designed and two/three-masted wooden motor-sailing yachts. Beautifully made out of heavy and solid hard wood, these are wonderfully stable to sail on. But it’s a good idea to prevent with sea sickness medication you know you are not getting drowsy, to fully enjoy your cruise. If you have booked an All-Inclusive Yacht Charter, then there is all provided for you, there might be the one or the other extra you would have to take care, but in general you have all your preferences already discussed with your crew. The same applies to an APA type charter; your charter yacht is ready when you step aboard. Your cabins will be fully decorated and outfitted for you, all sheets and covers are nicely fitted and you will find personal towels, beach towels too. The en-suite bathrooms or rather “head” in boating terms, are mostly providing you with facial/hand towels and soaps, shampoo and hairdryers. Mostly on the yachts stern platform you find a conveniently located outdoor shower with all the soaps and shampoos. Enjoy a “under the sky” shower every day! Ask for power adapters if needed! For your Activities you have all sorts of water toys to use. Note: Before your charter BoatsAtSea.com will be closely communicate over your food/drink/activity preferences, we will send you a form to fill out all and tell the crew about your group. The crew will make sure, all is supplied when you board. Valid passports with 6 months left on the expiration dates! Visas if required from your country of origin and the countries you travel through and where your cruise is taking place! Note: Valid passports are now also required for all US Citizens coming into the Caribbean. Dress is casual in the islands. Resort casual clothing is needed if you are thinking of dining ashore at one of the fancier restaurants. Its barefoot time and you will not need shoes on board, unless you have a specific pair of shoes, with white sole and be only wearing them on the charter yacht. BoatsAtSea.com suggests packing flip-flops for your shore visits and perhaps a pair of wet shoes for climbing over rocks and in the water. During the winter season it’s a good idea to pack an additional light sweater or a windbreaker. BoatsAtSea.com will communicate with you before you book your flight; usually we have good suggestions in “how-to-get-there”, as we book many charters in the same destinations! For your Virgins Island yacht charters, fly either into to: St.Thomas (STT) in the USVI and take the 45-minute ride with the fast ferry over to Road Town, Tortola, BVI. You can also fly through San Juan, Puerto Rico (SJU) to Beef Island (EIS), Tortola’s airport. For your Windward Island Cruise are many direct flights from New York and Miami to St.Martin/Sint Maarten’s (SXM) international Airport. BoatsAtSea.com will help you as many new Inter-Island commuter connections were established over the past months. 21. Where is my port of boarding to meet the Charter Yacht? BoatsAtSea.com will talk to you closer during the booking process, when you know your flight arrangements. In the Virgin Islands, due to an old USCG regulation some yachts are not allowed to transport more than six passengers in US waters, these yachts need to meet and greet their guests in the British Virgin Islands. Of course BoatsAtSea.com can make special arrangements in the event that you are more than six passengers and prefer a USVI meet and greet, talk to us! Pick-ups and drop-offs are usually at 12:00 noon, unless special arrangements have been made. BoatsAtSea.com will provide you with all the most important contact numbers and email addresses for your loved ones at home! Most yachts offer guest cell phones; WIFI and larger charter yachts offer even satellite phones. There may apply extra charges on these services. There are certain destinations, in which cell phone access is difficult. Also imagine, just a few sailing hours away and you are in a different country. But do not worry, BoatsAtSea.com gathered a lot of experience as we travel ourselve several times to these destinations and we can inform you on how to obtain a local SIM card. Oh yes! Please ask us for more details on our special Diving Yachts or find them online HERE. These captain and crew are excellent, patient and very knowledgeable PADI SCUBA certified Diving Instructors & Masters and can certify you to be a PADI Open Water Diver during your Diving Holidays. You never have been diving before and can’t be waiting to try? Blow your first bubbles while trying out a Resort Course or Discover Scuba Course! There is nothing more exiting than a jump into warm waters of the beautiful Caribbean Sea directly off your yacht and enjoy an aquarium-like dive without the hustle and bustle of the crowd. Note: In the Caribbean Islands further south of St.Barths and in the Mediterranean, mostly it’s only allowed to dive with a local dive operator! 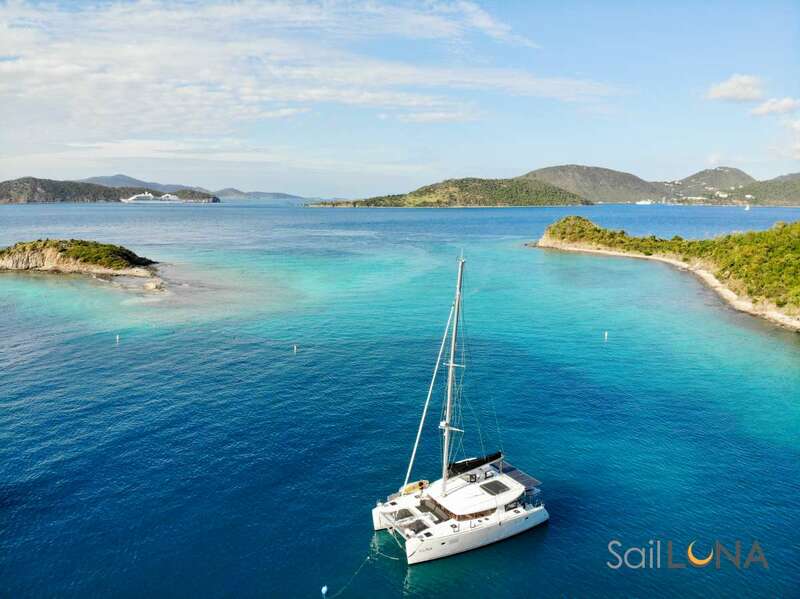 Whereas the Virgin Islands are considered to be the ultimate diving paradise and you dive off your yacht! BoatsAtSea.com loves to welcome you and the little ones on one of our Family Cruises! Children need to wear at all times a life west, best is to bring a fitted one that is comfortable and fun to wear. It’s a good idea to bring along some age appropriate games or DVD's, their own well fitting mask, snorkel and a life jacket (for playing in the water). Check out the Diving section as some yachts offer cool PADI Bubble maker kiddy dive programs for their activities! Please understand that the crew cannot be responsible for babysitting during your Family Vacation. Yes it is in most areas. For the Caribbean, in BVI waters, you need to obtain a fishing license, this can be done online. Note: Due to a common toxic alga in the Caribbean coral reefs, fishing is catch-and-release only, unless your captain approves, that the fish is OK to eat! Most Yachts are outfitted with the latest in that compartment for your ultimate and active yacht charter snorkel experience. It’s always a good idea to bring along your personal mask if you have one, otherwise the yacht might provide you with it all! Simple have BoatsAtSea.com informed on your personal preference sheet and also your shoe (fins) sizes. Most Yachts offer masks, snorkels, and fins for your Diving. They typically work 24/7 and are busy NOT to look very busy, as they don’t want to spoil your precious vacation feeling! Mostly they have just a 24hr turnaround between charters and not much rest. But they will always make you feel, as if they were as well on a vacation with you, this is outstanding professionalism. A crew's gratuity is based similar to every service related industry, on the customer’s satisfactory level and on his discretion. Customary are a 5-15% (MYBA - Mediterranean) 15-20% (CYBA - Caribbean) on top of your charter rate. (Additional cost) This may seem a lot but it’s the majority part of a crew’s income and it reflects a job well or very well done! This thrives the crew to work that hard and keeps a friendly smile in their face. The crew will share equally, a letter handed to them at the end of the charter with a personal note and the gratuity is more than welcome and appreciated. If there are multiple crewmembers - just give the gratuity to the captain and he will share it with the crew. Trip insurance is always a good idea and peace of mind for all your travels. BoatsAtSea.com can recommend you a good trip insurance. To summarize - we love what we do, are in business of providing a high standard and unique vacation experience with a yacht charter. BoatsAtSea.com maintains valuable partnerships in the industry; part because we are here since over 25 years and known to be loyal and very dependable. BoatsAtSea.com books many charter yachts per month, years of first hand experience help to prevent us from having “issues” before they become problems. One step ahead with BoatsAtSea.com.